Since I spent most of the weekend with a wicked sore throat and other varying illness effects, Monday was not an exciting lunch day. 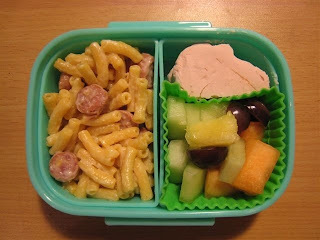 Thankfully, Shaun had made the kids mac&cheese and sausages on Sunday for lunch, so I had enough of that leftover to turn it into cold pasta salad. They both really like it, so no one came home with any food leftover. 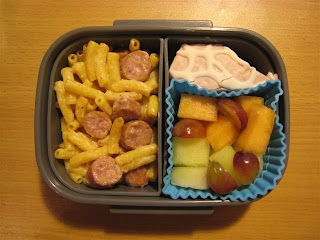 Both kids have the aforementioned pasta salad, a half of a heart shaped cupcake thing (leftover from Valentine's Day), grapes/pineapple/canteloupe/honeydew, and (not picture) a container of vanilla yogurt. It was the best I could do under the circumstances, falling over and playing dead is just not a good option for mommies.